Highway no. 20 in Colle di Tenda is more than just a feast for the eyes and soul; tucked away in these austere mountains is the Sibelco Group’s magnificent quarry. Located at an altitude of around 1,300m in the commune of Robilante (Cuneo), the quarry thrives on a highly compact, sedimentary quartzite originating from the permian/triassic period and metamorphosed in subsequent eras. The excavation process begins with essential investigative drilling to find out the quantity and, more importantly, the quality of the material. As quartzite is largely destined for the glass industry, the iron content of the best and most sought-after quartzite does not exceed 0.125. Mining is carried out through drilling and subsequent blasting. This takes place on descending terraces. The material is then transported for crushing (first with a jaw crusher and then with a cone crusher) before being sent to machinery at a height of 700m via a conveyor belt. The belt measures 2,200m in length (1,100m of which runs through tunnels) with an average slope of 28% and the capacity to transport 1,000 t/h, saving 1,000 Kw of electricity. Further down there is a third crushing process as well as wet grinding, horizontal flow classification, filtration and drying of certain products. 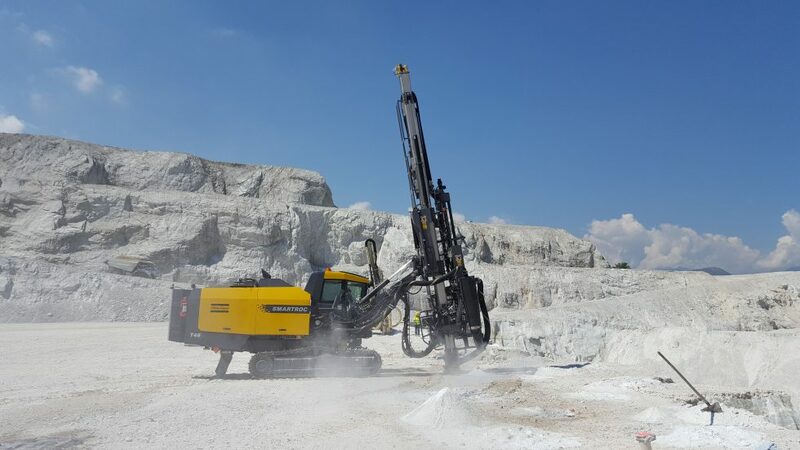 The brand new Atlas Copco SmartROC T45, fitted with a COP 3060EX drilling unit, is a world-class machine that is at the forefront of the entire quarry mining process. “This machine is a breakthrough”, according to Sibelco surveyor Massimo Isoardo. “It is used to drill to a depth of 15 to 19m and a diameter of 4 inches, usually in a vertical direction, using T51 pipes. After a couple of months’ work in the quarry, I have to say that the two most important parameters; Fuel consumption and penetration rate, have fully demonstrated that we made the right choice”. We are looking at the cream of the crop. “The SmartROC product is our future in terms of output and reduced fuel consumption”, adds Vincenzo Morabito, Sales Area Manager for Piedmont, Liguria, Valle d’Aosta and Lombardy for the Atlas Copco Civil Engineering, Quarries and Mining Division. “This machine boasts 20 l/h compared with 30 l/h in machines with the old design. When you consider that the machine is used for approximately 1,000 hours per year, the saving is quite astonishing”. The new SmartROC T45 is pitted against very difficult material that is highly broken up and abrasive. Consequently, the machine must possess a high air flow rate and pipes must have significant tensile strength. For this reason, the traditional COP 1840, which is normally found in Italian quarries, has been replaced in this case with the new COP 3060EX, which is able to drill larger holes. The machine is also fitted with COP Logic which controls the rock drill and adjusts according to the rock conditions. The rig is also equipped with an intelligent hydraulic system that sends oil only to where it is needed instead of sending it around the whole system, all the time. SmartROC T45 drill rig’s compressor runs on automatic rpm. This means that it is always working on lowest possible rpm which requires less energy compared to previous models. The drill rig boasts a spacious and ergonomic cabin, tailored to the operator, with two multifunctional joysticks. All of the instruments are located within an arm’s reach, allowing the operator to control drilling and the instruments simultaneously. A fully option equipped machine also engages the water mist to compact the material in the hole, to prevent the holes from collapsing. Atlas Copco’s final flourish is the way it guarantees maximum coverage, even during maintenance. This is achieved via four technicians working throughout Italy and supported in routine maintenance operations by a set of authorized workshops, all duly trained by the head office.